Huntington Beach’s#1 driving school is Varsity Driving Academy for many reasons. We offer two different ways to learn, both online and in a classroom and you can choose which way is best for you. Both versions get the same amount of attention, and then we meet up for the behind the wheel training. See all of our services below. Welcome to Varsity Driving Academy Huntington Beach! In Huntington Beach we offer free pick-up and drop-off for behind the wheel training sessions. In our special DMV Package we also offer this same service for the DMV test. Our students live busy lives, that’s why we are proud to offer online learning options that allow for plenty of flexibility. Our DMV approved course consists of all 30 required hours of learning and willfully prepare you for the written DMV test. If for any reason there are questions that you have while online, we are there to help. Give us a call and ask away. Classroom learning is a classic option that we also offer for students who feel more comfortable in a classroom setting. Taught by our certified instructors, students will learn everything they need to know in order to successfully receive their learners permit. There are three different sessions available during the summer months. These sessions fill up very fast so we recommend you sign up for your session as early as possible. After you’ve passed your written test, we can move onto the driving. First things first, you have to do your first 2-hour driving lesson with a certified instructor. The instructor will then validate your learner’s permit and you can begin your 50 hours of practice time with a licensed adult over 25. Don’t have an adult to drive with? No problem! We offer a number of behind-the-wheel packages to meet everyone’s needs. 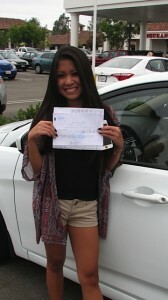 Angela Le, passed her behind-the-wheel test at Laguna Hills, CA. Varsity Driving Academy helps new drivers excel at learning driving basics and passing their DMV tests. Great job Angela!